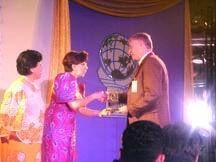 Erwin Van Den Berge of Anglo-Eastern Group shakes hands with Imson after receiving the FIEA trophy as Sto. Tomas looks on. 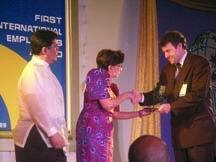 Dirk Fry of Columbia Shipmanagement Ltd. receives the FIEA trophy as he shakes hands with Sto. Tomas. 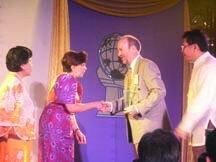 Hermann Eden, managing director of Marlow Navigation Co. Ltd., shakes hands with Inson after receiving the FIEA trophy as Sto. Tomas looks on. 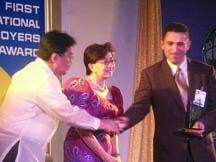 Carlos C. Salinas of Philippine Transmarine Carriers Inc. poses with Sto. 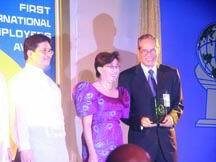 Tomas and Imson after receiving the FIEA trophy on behalf of the Norwegian Crew Management A/S. Bjorn Tore Larsen, chairman of Orient ShipManagement (Norway) AS, shakes hands with Sto. 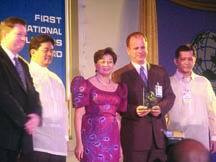 Tomas as he receives the FIEA trophy. Looking on is Lazo. Helmut Sallaba, employer’s representative of Schulte Group, shakes hands with Sto. 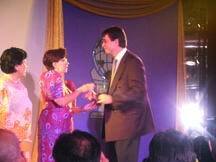 Tomas while receiving the FIEA trophy. Looking on is Lazo. 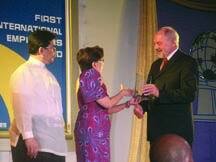 Hugo Haeselich of Bergesen DY ASA receives the FIEA trophy as he shakes hands with Sto. Tomas. Looking on is Imson. Joerg Vanselow, managing director of Dohle (IOM) Ltd., and Rolando Magcale of Philippine Transmarine Carriers Inc., pose with Sto. Tomas after receiving the FIEA trophy. Capt. 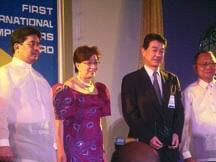 Kenji Machino of Mitsui OSK Lines poses with Sto. 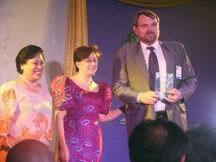 Tomas and Inson after receiving the FIEA trophy. Masaru Yamamoto, senior managing executive officer of NYK Line, poses with Sto. 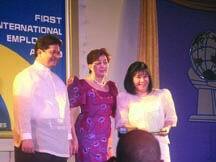 Tomas and DOLE Undersecretary Lucita S. Lazo after receiving the FIEA trophy. 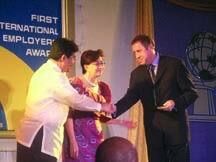 Ken Gillespie, director of the technical department of Princess Cruises, shakes hands with Sto. Tomas after receiving the FIEA trophy. Looking on is Lazo. Linds Boughton, general manager of Barber Shipmanagement Ltd., shakes hands with Sto. 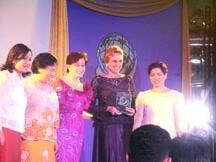 Tomas as she receives the FIEA trophy. Looking on is Imson. 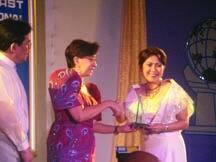 Josephine Francisco, president of Dolphin Ship Management Inc., poses with Sto. 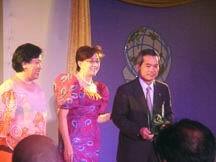 Tomas and Imson after receiving the FIEA trophy for Magical Cruise Co. Ltd.
Norimichi Yamamoto of Nissho Shipping Co. Ltd. shakes hands with Sto. 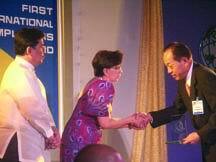 Tomas after receiving the FIEA trophy, as Imson looks on. Tor Johansen, head of the crewing section of the Odfjell Ship Management ASA, poses with Sto. Tomas and Lazo after receiving the FIEA trophy. Caroline R. Kimball, generalist of the marine human resources of the Royal Carribean Cruises Ltd. (2nd from right), poses with (from left) CF Sharp administrative manager Aurita Milanco, Lazo, Sto. Tomas and Levy Rebamontan, president of Avantgarde Shipping Corp.